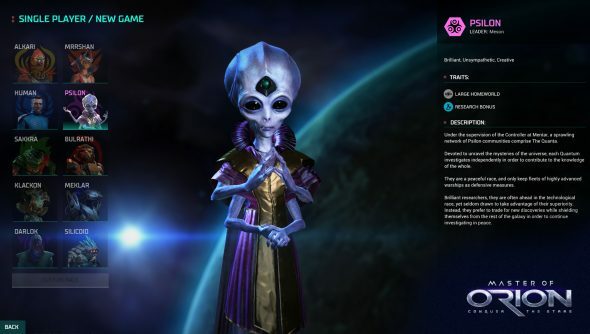 Wargaming Labs rebooting Master of Orion is, perhaps, the most surprising news of the year. They’ve been at it for a while now, with the announcement coming in June, but this trailer is the first time we’ve seen the game in motion. It highlights two of the game’s races, the lizard dude Sakkra and the very-gray Psilon Quant and your options when interacting with the galaxy through each of the 4Xs. Strategy eh? Our best strategy games over here. Definitely missed the mark on the ‘hilarious’ robots, but I liked the 4Xing that was on display. The cinematic when colonising a new planet is very pretty and the interface looks nicely simple with the ability to hide what will inevitably be a lot of depth. Not so sure about those combat screens, I’d expect a fight with something called a space dragon to be a little more exciting. Of the two races, I’m more drawn towards the angry Sakkra. Somebody should probably tell their leader that rather than menacing and frightening he’s just kinda cute, but beyond that conquering the galaxy has always been more appealing to me than teaching it a new kind of biology. But what’s an Excellence Victory when it’s at home? Is that where everyone agrees you’re sorta great and so deserve the win? This just a pair of the ten races that are promised to be in the full game, which is yet to get a release date but I’d guess some time in 2016. There’s pre-orders available now, but the only reason you might want to hit them up is the collector’s edition coming with the original three MOO games and promised Early Access for this title.